This should have been posted earlier but somehow got delayed. New year’s eve soba noodles or “Tosh-koshi soba”年越しそば appears to be a common custom in Japan (with about 57% of the population participating according to Japanese Wikipedia). When I was growing up, however, our household did not have this custom at all. 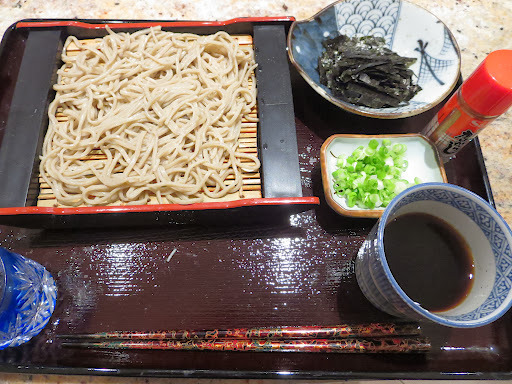 We usually had a feast on New Year’s eve that did not leave any room to eat soba even if we wanted to. It appears that the custom started in Edo period 江戸時代 for good luck/longevity (longevity because soba is thin and “long” and to “cut” bad fortune from the previous year as soba is brittle and easily can be cut). 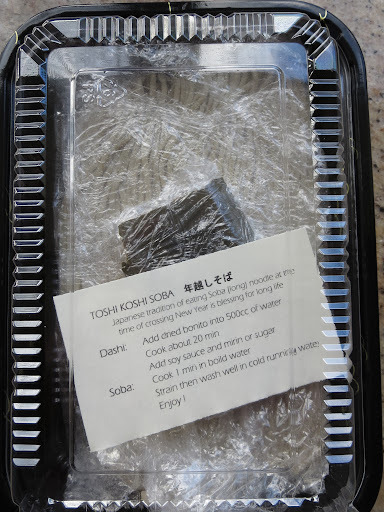 In any case, Sushi Taro Osechi also included hand cut or “teuchi” 手打ち “Toshikoshi soba”. We were too full to eat this on the New Year’s eve but we ate this as a lunch on the second day of the New Year. There appears to be many variations of toshikoshi soba (cold or hot in a broth etc), I made it to “zarusoba” ざるそば as you see above. (“Zaru” means “bamboo basket” as the noodles are served a special flat bamboo basket or in a special container like I used). The noodles had a nice al-dente texture and we enjoyed it although it was not the “end-of-the-year” but “beginning-of-the-year” soba.